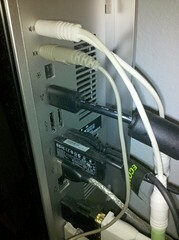 Overall, setting up a Windows 7 and Ubuntu Linux dual boot on the HP Firebird with VoodooDNA 802 was a breeze. So QUIET! It ranges from 10 dB (extremely quiet) to 30 dB (quiet room – my EeePc 901’s fan are this quiet), and you can sleep with it on. The internal HDD does not make any noise. Surprisingly, the bundled mouse and keyboard’s USB receiver seems to work natively with the computer, regardless of whether it’s the command prompt, Linux, or whatever. Nice. When I saw the 2.5 dual HDD were 5400 RPM I thought of getting an Intel 25M 80G SSD but so far it runs pretty well and SSDs may see drastic price drops over the next few years so I’m postponing that a year or two.